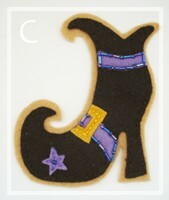 Print and cut out the witch's shoe pattern. 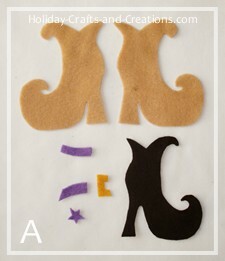 Now trace and cut out the felt as follows. See photo A.
Sew the black shoe onto just one of the tan backgrounds using the backstitch in black thread. Next, line up the purple strap that goes with the gold buckle and stitch the buckle on using the backstitch in yellow thread. See photo B. 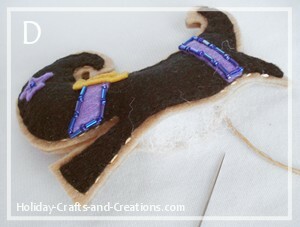 Now sew on the two purple straps by bordering them in purple beads. 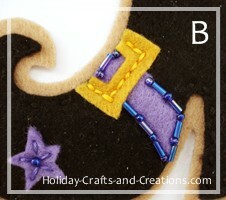 Also stitch on the purple star with a seed bead in the center and one stitch into each point of the star. See photos B and C.
Stitch the front shoe piece to the back tan piece using the running stitch in tan thread. Leave an unstitched hole (about 1.5") along the back of the shoe. To give the shoe a little dimension, stuff some polyfill into the shoe and then finish stitching the shoe closed. See photo D. Now make the witch's other shoe. 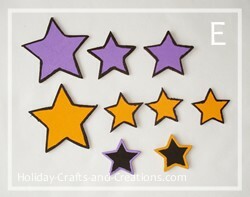 Using acrylic paint, paint your wooden stars. We used purple, orange and black paint, and we also outlined our stars for added dimension. 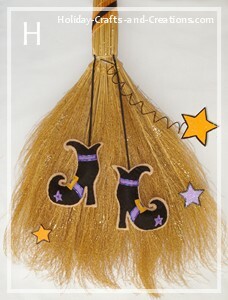 See photo E.
Spray the broom with spray glitter. If the spray glitter isn't as showy as you'd like, you could also brush on some Elmer's glue and then sprinkle bottled glitter onto the glue. 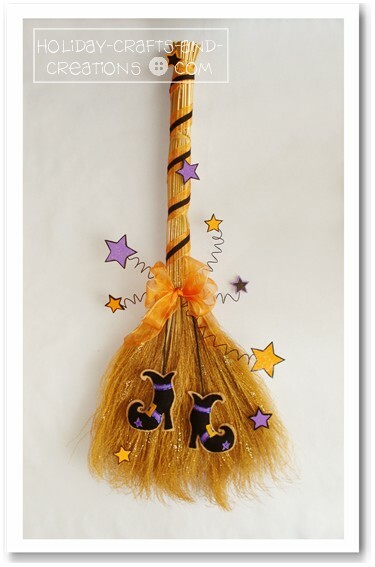 Once the glitter has dried, wrap the handle of the broom in ribbon. Hot glue one end of the ribbon to the top of the handle on the backside. Then wrap the ribbon around the handle and glue the other end at the base of the handle on the backside. If the ribbon tends to shift around too much, just glue the ribbon to the handle in a few more places on the backside. Next, to make the coiled wire for the stars, wrap the wire around something wide, like a marker. 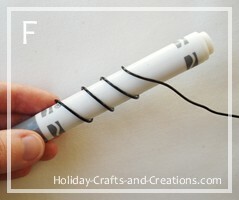 See photo F. Then, to lengthen the tight coil, just gently pull the coil apart. Make these in varying lengths so that the stars will look like they are coming out at random. 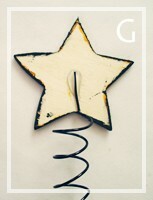 Once your stars are dry, hot glue one to each of the coiled wire pieces. 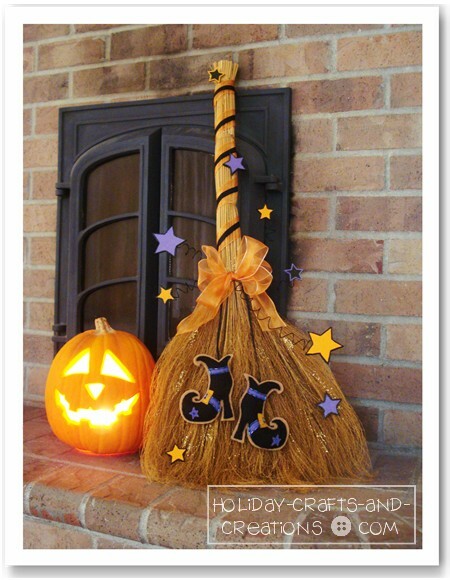 See photo G. You may want to save a few stars to glue directly onto the bottom of the broom without any wire, as well as on the handle. Now hot glue a piece of black ribbon to the back of each shoe, and then hot glue the other end of the ribbon to the base of the broom handle. Make sure to hot glue the ends on either side of the handle so that the shoes hang next to each other and not on top of each other. Once you have done this, begin gluing the pieces of wire to the base of the handle as well. See photo H. Continue gluing wires down until you have as many as you would like, we did five. Now glue a few stars to the broom handle and a few down around the shoes. 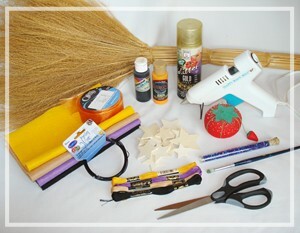 Make a simple bow and hot glue it at the base of the handle to hide the ends of the wires. Your enchanted witch's broom is now complete!